Call 510.521.2634 for your Design, Installation, and Maintenance needs. Residential lawn care and landscaping. Dependable for homes, businesses, and HOA's. Ask us about green services. McDaniels Landscaping provides top quality lawn care, landscape design, installation, and maintenance in Alameda, Oakland, and beyond. Whether you just need bi-weekly lawn service at your home or complete landscaping services for your HOA or commercial property, call McDaniels and get the job done right every time. We also provide green landscaping services, irrigation installation and repairs, low voltage lighting and fence repairs and installation, and more! Check out our complete list of landscaping and lawn services. I asked Dennis and his crew to clean up my backyard that had not had any attention in almost a year. Grass was waist high and the gardens were worse. It was easy to schedule with him and his crew came and transformed the backyard and did an amazing job of not only cutting and trimming the lawn and gardens neatly but they swept up the entire back patio and walkway. Awesome job! Give them a call! Dennis is very professional and very attentive to detail. He is always readily available and very responsive to any problems. Dennis and his crew do beautiful work. They are my first call whenever I need anything done and Dennis always works with my schedule. I would highly recommend them to anyone. - Tanya, Property Management Maintenance Supervisor for HBR. McDaniels Landscaping has been responsible for the care and maintenance of our front and back yards for over five years. They are always prompt, efficient and extremely neat. On many occasions we have requested additional services including pruning, weed abatement and fertilizing over and above the agreed upon yard work. Dennis and his staff have always accomodated our needs at very reasonable rates. 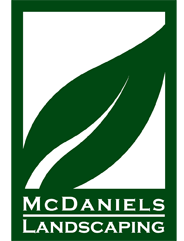 We would recommend McDaniels Landscaping to anyone who cares about the quality of their lawn and garden.